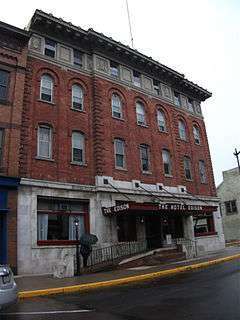 The Hotel Edison in Sunbury, Pennsylvania was built in 1871 by entrepreneur Edward T. Drumheller and opened as the City Hotel in January 1872. It was the first building to be lit with Thomas Edison's three-wire system in July 1883. It was renamed the Hotel Edison in 1922 during Sunbury's 150th anniversary. It is located on Fourth and Market Streets and has 51 rooms and 15 residential apartments. Edison first came to Sunbury in 1882 to build the first three-wire central station incandescent electric lighting plant. The area was chosen in part for its proximity to anthracite fields in the Shamokin area and an abundance of coal, a good fuel source for The Edison Electric Illuminating Company of Shamokin incorporated at Sunbury on April 30, 1883. The company had established itself earlier in New York City. The City Hotel was renamed the Edison Hotel in 1922 when Thomas Edison returned for Sunbury's 150th anniversary and a plaque at the entrance to the Edison Hotel was dedicated. The city celebrated the 125th anniversary of Edison's Sunbury Experiment in July 2008. Early innovations at the hotel also included a hand-operated elevator. Part of the hotel burned on January 14, 1914. It was renovated with a new façade and the addition of a fourth floor. The hotel is purported to be haunted by a spirit named Ramona. A ghostly image appears in an old photograph in the lobby of the hotel from the early twentieth century, a faint image of a child sitting on the porch steps.